biology 101, biology and behavior, biology matters, different peoples is different (duh! ), europe, europeans, family types, father's brother's daughter marriage, hajnal line, iberians, manorialism, mating patterns matter, relatedness matters, spain, spaniards, what's this hbd business all about anyway? 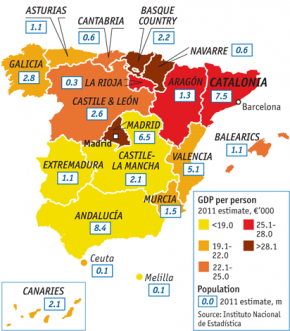 why, then, the apparent north-south divide in spain (if it’s real)? high historic rates of cousin marriage also tend to be present outside the hajnal line. historians generally agree that very close endogamous marriage practices were common in moorish spain — fbd marriage even — and they continued right up into (at least) the sixteenth century. perhaps regional differences in mating patterns/family types persisted in spain despite the movement of peoples during the reconquista. 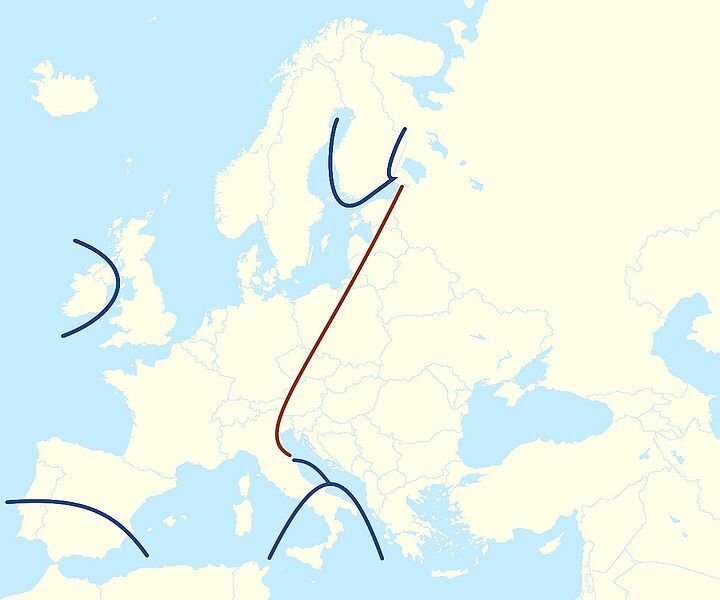 it could be that northerners who moved south through the country, replacing (or eventually outnumbering) the moors, adopted closer mating habits as they moved southwards. it wouldn’t be the first time, i don’t think, that a transplanted group adopted the marriage practices of the broader host population. 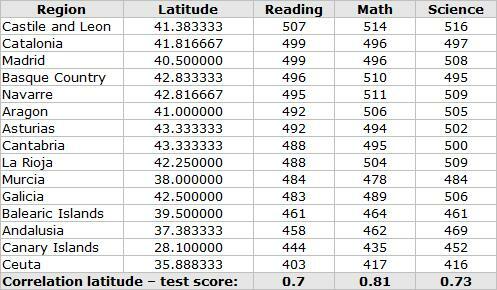 see also: Mapping The 2009 PISA Results For Spain And Italy from the reluctant apostate and IQ Ceilings? from jayman. here are the results for the world values survey‘s civicness questions for spain (2007) by region. the civicness scores for spain are, across the board, much lower than those we find anywhere in the anglo world including the u.s. it’s hard to tell if there’s a north-south and/or east-west civicness divide in spain because there’s no data for so many of the regions; but it is interesting, i think, that the most southern and most western regions (andalusia and galicia) have such low scores while catalonia in the northeast and madrid have the highest scores. andalusia has had a long history of close marriages, and i suspect the galicians, too, but i’ll have to get back to you on that. i also think it’s interesting that andalusia and galicia are two of the regions from which many of the spanish settlers in mexico originated — and, as we saw the other day, whites in mexico have some of the lowest civicness scores in that country, relatively speaking. mexico, however, generally has higher civicness scores than spain. go figure. biology 101, biology and behavior, biology matters, different peoples is different (duh! ), europe, europeans, general theory of the west, inbreeding, inbreeding in europe series, kissin' cousins, mating patterns matter, relatedness matters, spain, spaniards, what's this hbd business all about anyway? so, we’re talking about central spain here — not all that far away from madrid by the looks of it. however — and this is an important however — we’re talking about mountain populations here and mountain populations tend to inbreed more than low-landers since they’re often quite isolated. the peak of consanguineous marriages up to second-cousins was in the 1925–1934 period when the cousin-marriage rate hit 7.35% of all marriages. the lowest point was in 1965–1975 with a rate of 1.13%. the rate for the first decade recorded here, 1874-1884, was 3.44%. a gradual but steady increase for 50 years (100+ years in italy) with a peak in the 1920s and a sharp decline from then on. quite remarkable. this part of spain doesn’t show the post-wwii bump that italy did, tho. and spain was neutral in wwi, so never mind. “Prior to industrialization an inbreeding pattern characterized by increasing values throughout the 19th century was common to many societies, both European (Calderón et al. 1993; Morales 1992; Pettener 1985) and American (Gradie et al. 1991; Madrigal and Ware 1997). In many European populations, inbreeding was highest in the period from 1875 to 1915 (O’Brien et al. 1988), while in Spain high inbreeding levels persisted for a longer time. 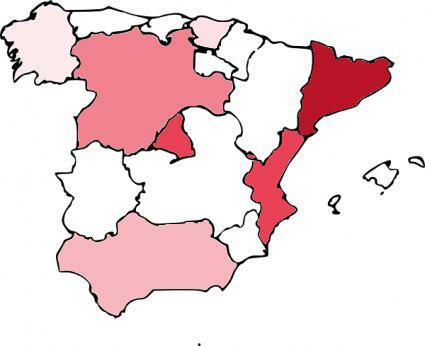 In comparison with other large Spanish regions for which consanguinity has been studied, Gredos shows a general delay. Inbreeding increased during the first part of the 20th century, high levels of consanguinity persisted nearly up to the middle of the century, and a decrease in inbreeding was not noticeable before 1945. This pattern closely resembles that of another Castilian region, Sigüenza-Guadalajara Archbishopric (Morales 1992). However, it contrasts with that found in the north of Spain by Varela et al. (1997) in the Archbishopric of Santiago de Compostela, where inbreeding was at its highest between 1910 and 1920, with the inflexion point corresponding to 1920, and by Calderón et al. (1993) in Alava province, where the maximum level occurred between 1881 and 1901.
yeah. but why the increasing rates in the 19th century? what was THAT all about? was it simply a result of increasing population sizes? maybe. and, how did — if it did at all — this pan-european (and latin-american) increase in inbreeding affect the sentiments in the populations? could it have made them more nationalistic? sure, inbreed too much and you just get tribalism — but inbreed to just the right degree and, i think, you may get some strong nationalistic tendencies. i dunno. 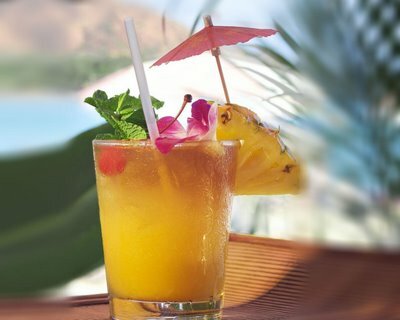 haven’t thought it all through yet, and not gonna right now ’cause i’m already late for happy hour…. human biodiversity, inbreeding, reality check, relatedness matters, where does culture come from? arabs, biology 101, biology and behavior, biology and culture, biology matters, different peoples is different (duh! ), europeans, general theory of the west, inbreeding, inbreeding in europe series, inclusive fitness, kissin' cousins, mating patterns matter, medieval europe, saracens and mohammedans and moors oh my!, spain, spaniards, visigoths, what's this hbd business all about anyway? ok. so, moving counter-clockwise around the periphery of europe: spain. medieval spain is complicated. ¡muy, muy complicado! there are so many different populations: visigoths, other germanics, moors, basques, cantabri, jews…. 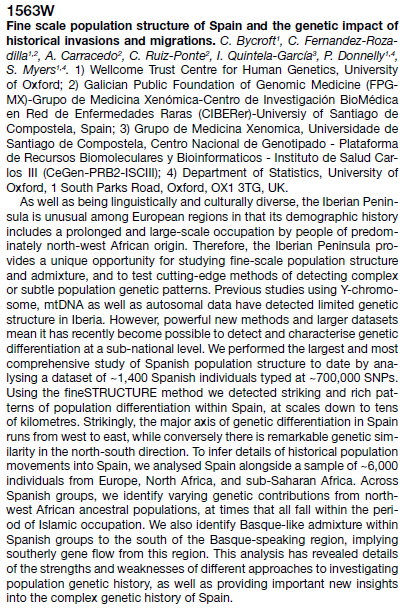 so, this is not going to be the last word on inbreeding in medieval spain at all. it’s barely even the first word. 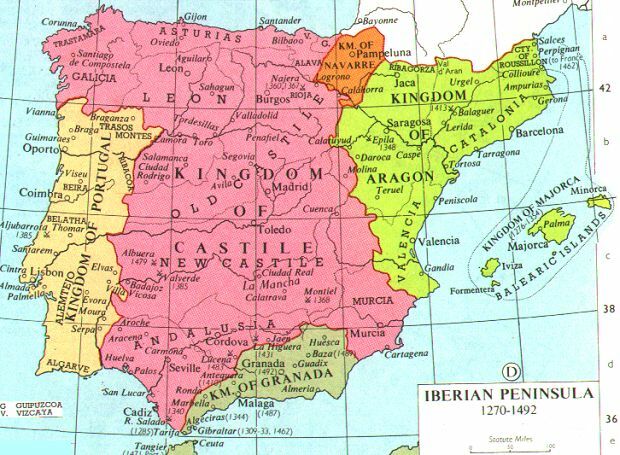 but, broadly speaking — really broadly speaking — there was a north/more outbred versus a south/more inbred divide in medieval spain. that’s pretty much because you had christians in the north who, like we’ve seen, were under pressure from the church authorities to out-marry; and you had muslims in the south who brought with them their tradition of strong inbreeding. the visigoths controlled a large part of the iberian peninsula in the early medieval period (418-721). they converted (or, at least, their king at the time did) to nicene christianity in the late 500s (they’d been arian christians before that). ausenda suggests that the pre-christian visigoths married close-relatives, including cousins, and that they had a patrilineal, tribal society. like the other gemanic tribes, they began to outbreed more and more after converting to christianity since the church demanded out-marrying. this scenario is probably more or less correct, but i wonder if the visigoths were actually less influenced by the church’s laws than other germanic peoples living further north, like the franks. mitterauer insists, rightly so imho, that tribalism and feudalism do not go together (see, for example, the irish). you cannot get to a feudal society until you get rid of tribalism — and you cannot do that without outbreeding. the visigoths in spain, according to mitterauer, were less feudalistic than their counterparts the franks, so perhaps they hadn’t moved so far along the outbreeding path as the franks during the early medieval period. then the moors arrived and wreaked bloody havoc on the whole system. the latter pattern we’ve seen already amongst the northern germanics: the church and tptb put an end (more or less) to inbreeding in those populations which brought about the demise of the tribes. the introduction of the feudal/manorial system plus continued outbreeding further broke down the extended family (a tribe being just a very extended family) leaving central europeans with nuclear or stem families (a stem family is where one married child remains living with his parents, so you get grandparents + a nuclear family in one household). “The Arabs and Berbers who conquered the peninsula did so not as isolated warriors, but as members of organized tribal groups. The Arabs and most of their early Berber allies were members of agnatic, patrilineal groups forming a segmentary social system, whereby individuals belonged to a hierarchy of increasingly inclusive segments, from the clan up to the tribal confederation. The basic tribal unit, the qawm (variously translated fraction or clan), is a unit of several hundred tents or families, linked agnatically. That is, the kinship system ascribes importance only to relationship through males. In such a system, endogamous marriages are viewed as the ideal because through endogamy power, prestige, and wealth are retained within the agnatic group rather than shared with a competing group into which a daughter might marry, with parallel-cousin marriages (the wedding of one’s son with the daughter of the paternal uncle [i.e. fbd marriage]) preferred. A cross-cousin marriage (with the daughter of the maternal uncle or paternal aunt) is considered exogamous because the offspring gain a different lineage. The more powerful a tribal group is, the more women it will attract from outside, the fewer it will lose, and the more endogamous it will become. “Guichard demonstrates that the early Muslim residents of the peninsula settled in tribal or sub-tribal groups and that, indeed, it was the policy of important figures to travel with tribal entourages and to reconstitute their clans once the decision to settle in al-Andalus had been reached…. “Arab and Berber tribal structure found political expression in the organization of confederations or alliances, which were formed according to the underlying logic of segmentary societies. The essence of this kind of political organization is that politics is viewed as a zero-sum game. The wealth, power, and prestige of one’s own group are increased only by decreasing those of a rival group, leading to a more or less permanent state of conflict between neighboring groups as well as to characteristic patterns of alliances…. this is totally unlike what was happening in northern europe throughout the middle ages. northern europeans became less tribal — in spain, especially southern parts of spain, tribal life was alive and well. 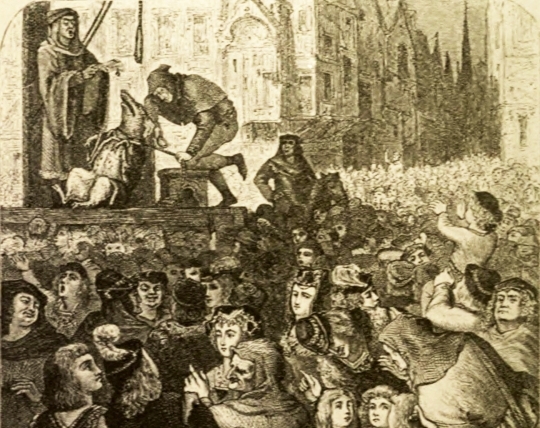 glick describes how, in the wake of the reconquista, feudal structures took hold throughout spain, starting in the north and progressively moving southwards. the population converted back to (or to) catholicism — ’cause they had to — and, presumably, they had to start following the catholic codes on marriage, altho as we saw above the mariscos resisted this for quite a long time. quite extraordinarily, researchers looking at catholic church dispensations for cousin marriage in sigüenza in north-central spain between the 1950s and 1980s found that the folks there were marrying their first- and second-cousins at a rate of 12.6% [pg. 4; abstract here]. in the early 1940s, the overall rate for endogamous marriage in spain — and this is including uncle-niece marriage — was 4.1% [pg. 4]. the overall rate for france in the late 1940s was 0.8%; london in 1950, 0.4%; the netherlands in the late 1940s, 0.2% [pgs. 2 & 5]. 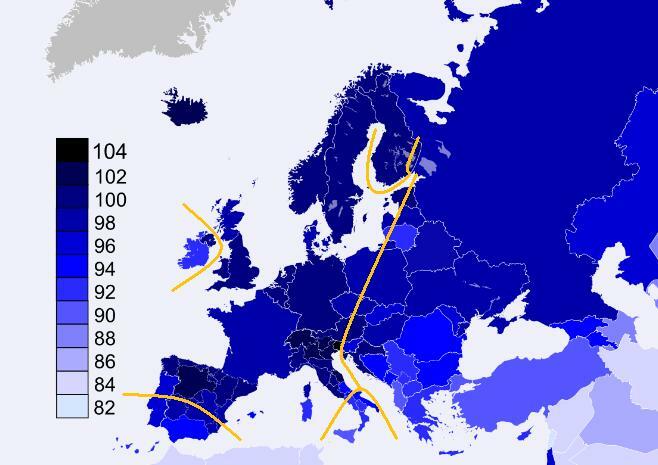 close relative marriage has obviously remained more common and more important for longer in spain than in northern european populations.